You could write a whole essay on Whitney Houston's career alone without ever having to mention her numerous acting roles. However, it is 1992's "The Bodyguard" that set her second career in motion. Before delving into that film though, let's note some fun trivia regarding said movie. "The Bodyguard" got generally dismal reviews when it was released in 1992 and then went on to take in well over $120,000,000 in U.S. box office receipts and over $400,000,000 worldwide. So much for film critics. The compact disc of the film's music became one of the biggest-selling soundtrack albums in history. The movie was written in the early seventies as a first-ever script by Lawrence Kasdan, who went on to do a few things you might know, like "The Empire Strikes Back," "Return of the Jedi," "Raiders of the Lost Ark," "Body Heat," "The Big Chill," "Silverado," "The Accidental Tourist," "Grand Canyon," and a couple of yawners, "Wyatt Earp" and "Dreamcatcher." "The Bodyguard" was originally intended for Steve McQueen and Diana Ross, but McQueen bowed out and studios thought the premise too controversial. Then it was going to be made with Ryan O'Neal and Ross, but the two actors had a falling out. Finally, it was championed by Kevin Costner, who stars here with Whitney Houston. Two years after the picture was made, the story was reworked in Hong Kong as "The Defender" (1994) with Jet Li. You can see this thing's been around, and it carries a history. But is The Bodyguard any good? That's what we are here to here to discuss. The plot is pretty simple. Hugely rich and successful pop-star, singer, actress Rachel Marron (Houston) is being stalked and threatened by what her personal manager, Bill Devaney (Bill Cobbs) presumes to be a psychotic killer. Ex Secret Service agent Frank Farmer (Costner) is hired to protect her and her eight-year-old son. Naturally, it's hate at first sight. Rachel thinks Frank is too fussy and overprotective, and he thinks she is arrogant and foolhardy. Just as naturally, the two eventually fall in love. This kind of thing is always happening in fiction. Even in today's films there are numerous instances of two people from completely different worlds somehow finding one another. All it takes is the right circumstances...or a psycho killer. It's not that the film is all bad. There are a great number of things that when combined make the film worthy of its following.The score is quite good and Houstons's voice is simply epic. The house the filmmakers used for Rachel's place is stunning; in reality it being the Beverly House in Beverly Hills, California, the location for dozens of other movies (including the famous horse's head mansion in "The Godfather"). The reference in the movie to Kurosawa's tongue-in-cheek samurai saga, "Yojimbo," a film about a warrior who hires himself out (like Costner's character), and a film whose English title was literally "The Bodyguard." Costner's haircut, which is supposed to remind us of Steve McQueen, as well as the name of Costner's character, Frank. Or perhaps you don't remember one of McQueen's most famous roles, as Frank Bullitt. A proposed chase scene that never came off at the end of "The Bodyguard" might have helped bring all those subtle clues together. The kid who plays Rachel's son, Fletcher (DeVaughan Nixon), is friendly and agreeable; and the fellow who plays Rachel's security chief, the muscle-headed Tony Scipelli (Mike Starr), is a loveable tough guy. Beyond that it's difficult to find anything redeemable about the plot or characters. Costner plays the stiff cold fish type to a T but really lacks chops to give his character any kind of depth. Houston's performance can be forgiven because it was her first time up at bat. But what really made this movie was her rendition of Dolly Parton's "I Will Always Love You" and a soundtrack of solid radio hits. Now after her tragic passing the film comes to Blu-ray with only a few extras to speak of: a making of documentary, the music video for her hit song and a trailer of the movie. Not much to get worked up over. Losing Whitney Houston was truly a tradegy, especially after the way her life spiraled over the years. She had an incredible voice and natural beauty. Her life as a perfomer was practically guaranteed from birth and re-watching The Bodyguard now is truly bittersweet. So for all those fans out there who want to see Whitney at her peak, you couldn't pick a better film for it. Download The Bodyguard from the iTunes Store in Digial HD. 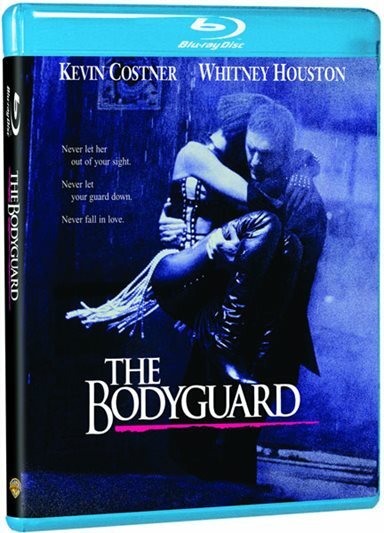 For more information about The Bodyguard visit the FlickDirect Movie Database.